Gamagara Development Forum (GDF) is committed to developing sustainable and prosperous communities through articulating and acting upon the needs of our beneficiary communities which we serve. Hence we have engaged in the construction Miss Memory Visagie’s house, who is a community member who is looking after the local community food garden and also taking care of her children and grandchildren. This is a project that deals with poverty alleviation, entrepreneurial development and job creation. Miss Visagie is the founder of the Tsholofelo Food Garden which GDF has funded. She was staying in shack with no proper facilities in place, there was a need for a decent house for her, her three children and five grandchildren. The project will create employment for the youth, women and men in Gamagara through the construction of the subsidy houses and present opportunities for the local business community through subcontracting and the supply of building materials. It will also provide training opportunities to the youth and women and equip them with skills in various trades of construction. It will contribute to investor confidence in the Gamagara region by creating an enabling environment for business people and provide a sense of security and a healthy neighbourhood. The GDF will construct a total of 200 subsidy houses over a period of two years on already surveyed and serviced stands in the different areas of the GLM. The beneficiaries will enjoy a better standard of living in houses with two bedrooms, bathrooms with a toilet, kitchen and lounge. 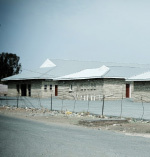 The Gamagara Local Municipality will provide water, sewerage and electricity to the new development.